First three hours were gone in a blink. 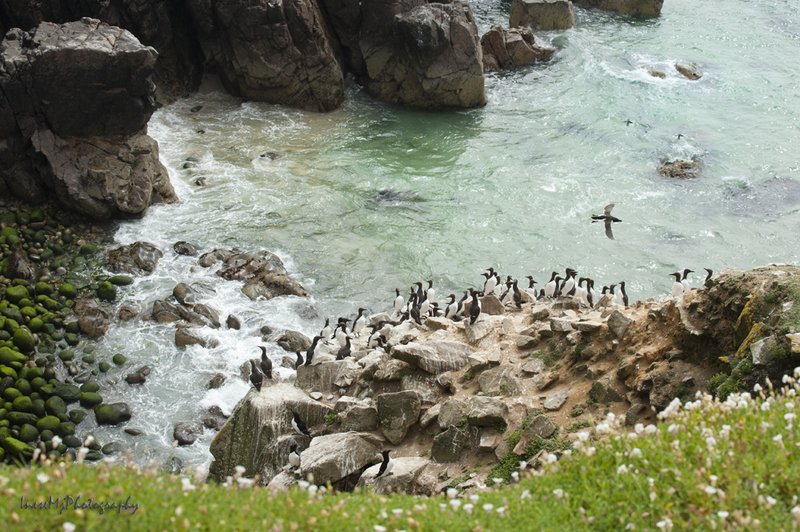 It is the magic of Puffins. 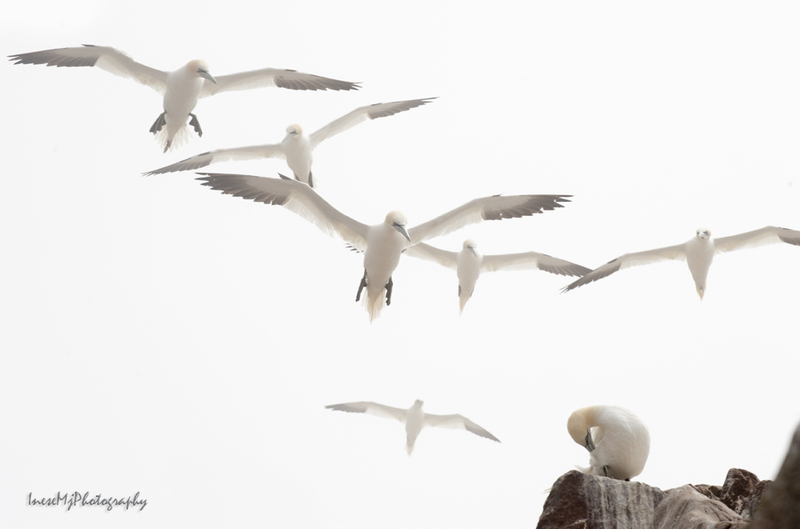 I was on my way to the Cat Cliff on the Southern end of the island – the land of the Northern Gannets. 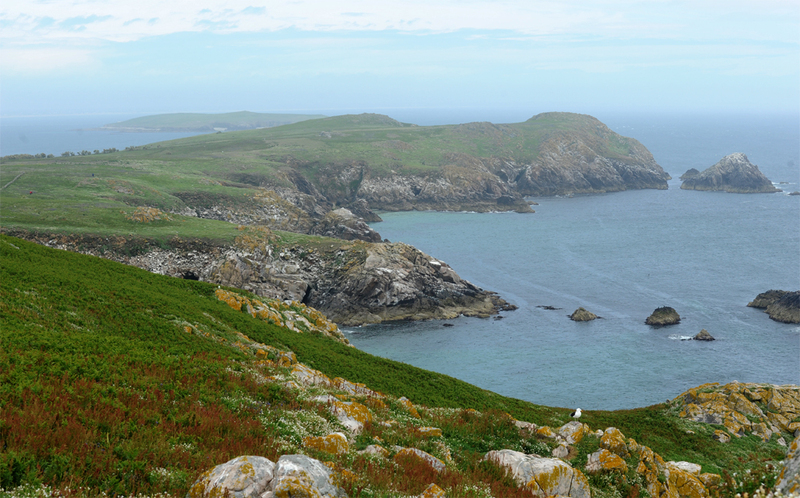 Great Saltee island ascends from 3-5m high shore on the mainland side to 20-30m high cliffs on its south-eastern side. The Southern Summit rises to an altitude of 58m. I was walking along a stone wall, and after it ended the path took steep up through the waist-high ferns. On the summit I made a stop to take a picture. It was still foggy. 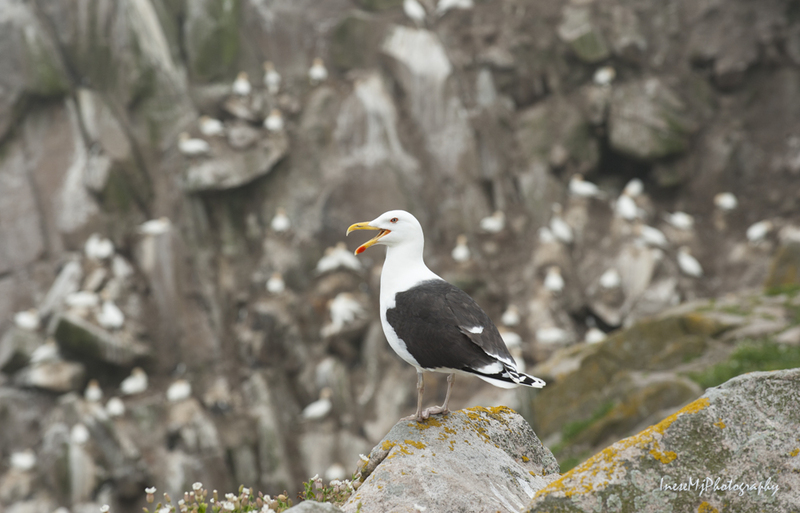 A Great black backed gull was standing on a rock. I came closer. It is a large bird, a predator attacking and killing even the far larger animals and birds, and I didn’t want to take a risk. Yet, I didn’t notice the chicks until they ran and hid themselves, and only then I knew I was in trouble. 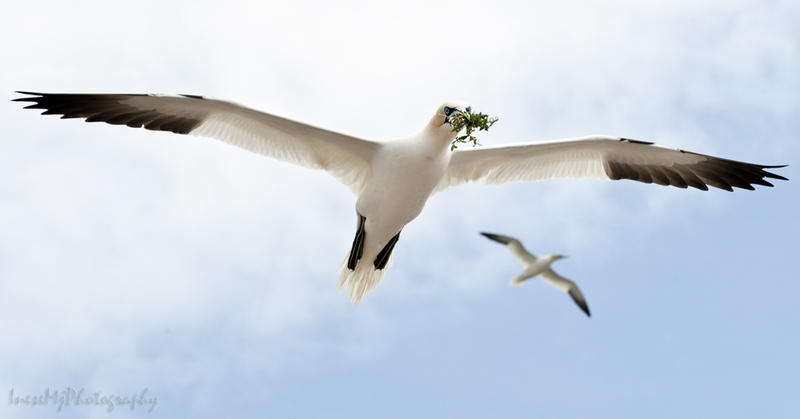 The last thing I needed was to be struck by a gull! 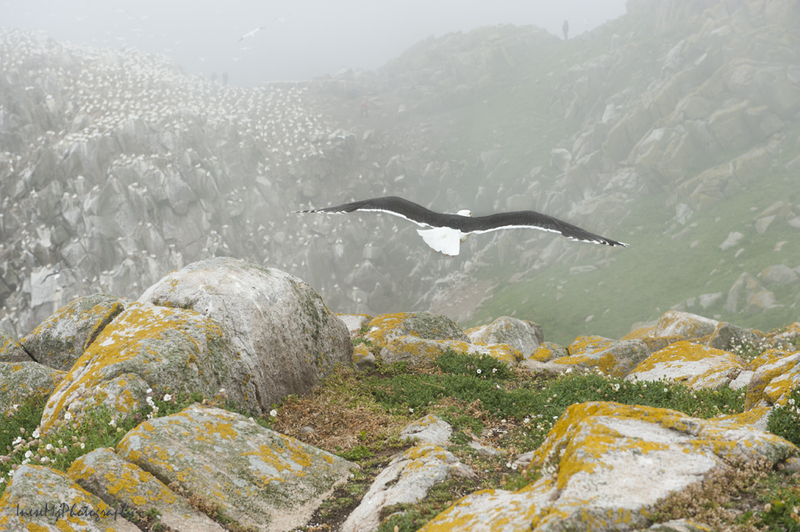 I turned back and walked away as fast as I could without running in panic, while the gull’s partner repeatedly flew over my head diving low enough to touch my hair. 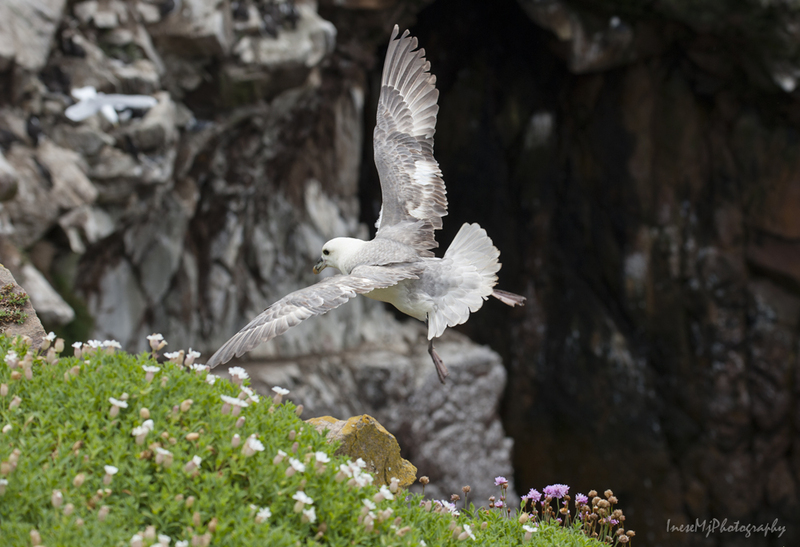 With its wingspan of 150-170cm the attacking gull was as good as a small aircraft. 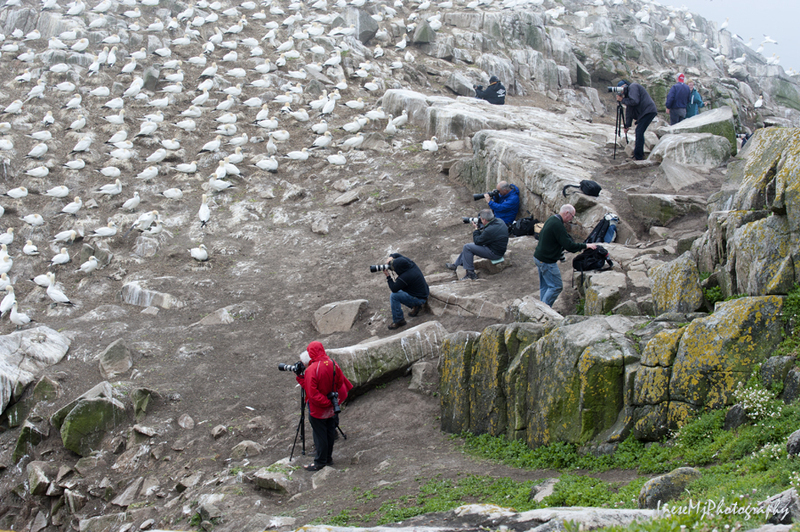 I caught up with the other photographers and we headed to the Cat Cliff barely visible in the mist. 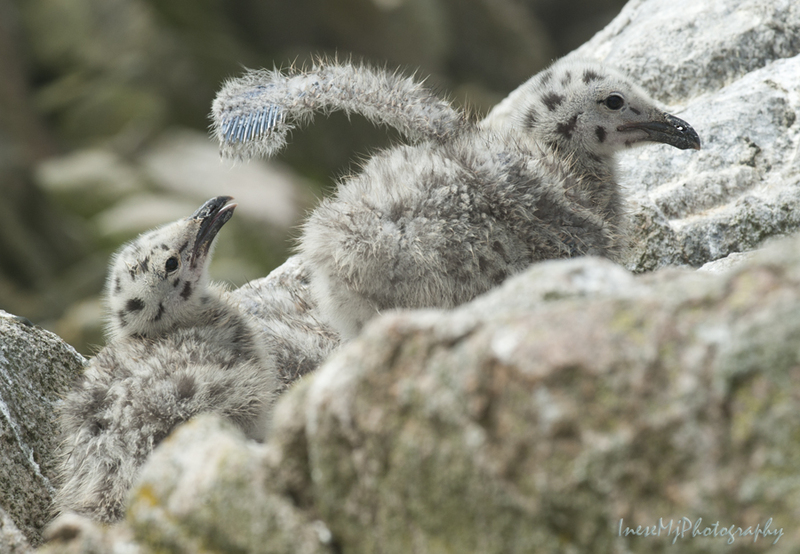 There was another gull – a male with no chicks around ( we will see them later). 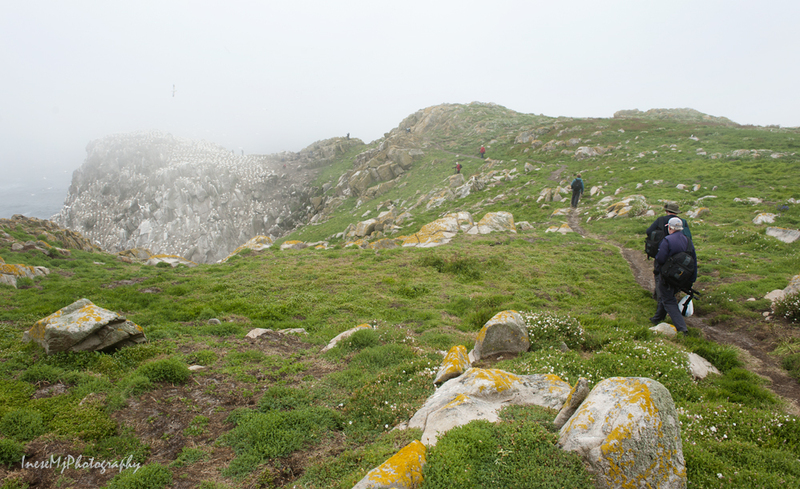 To get to the Cat Cliff takes an effort, but it was a fun climb because of the many species of the sea birds and their young we met on our way. 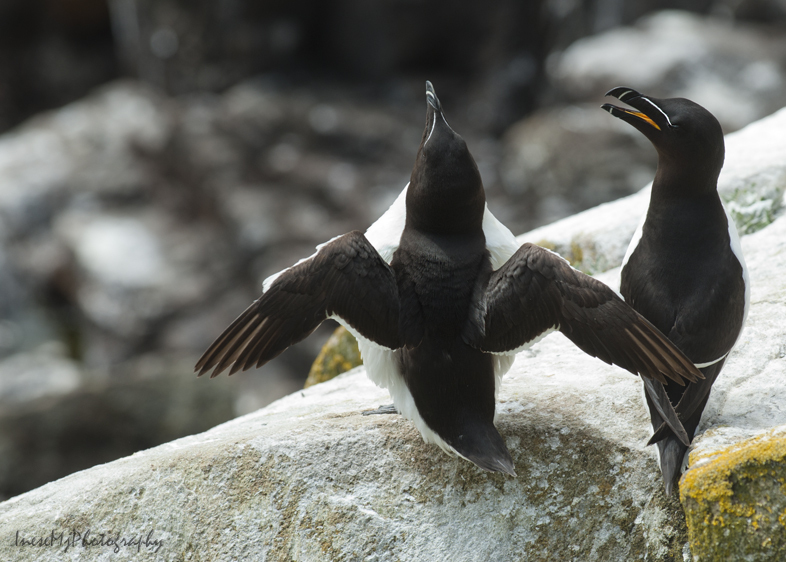 Look at these Razorbills with their soft fluffy bellies. 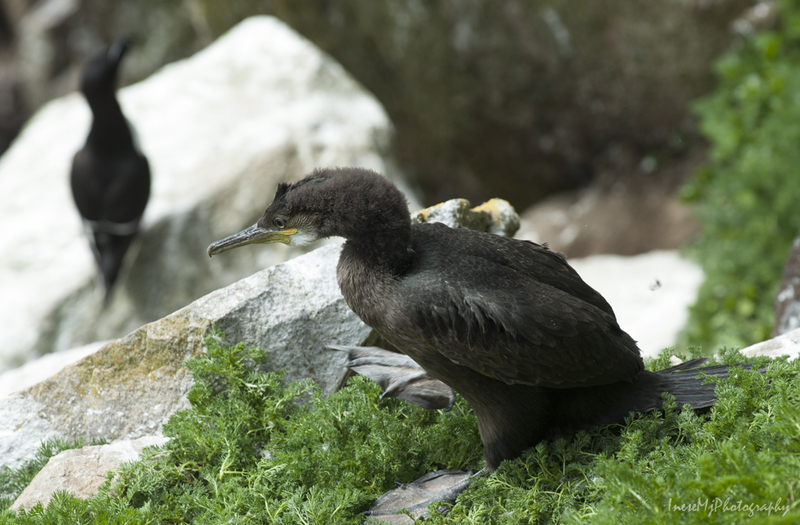 …and makes a careful step with his clumsy webbed foot. 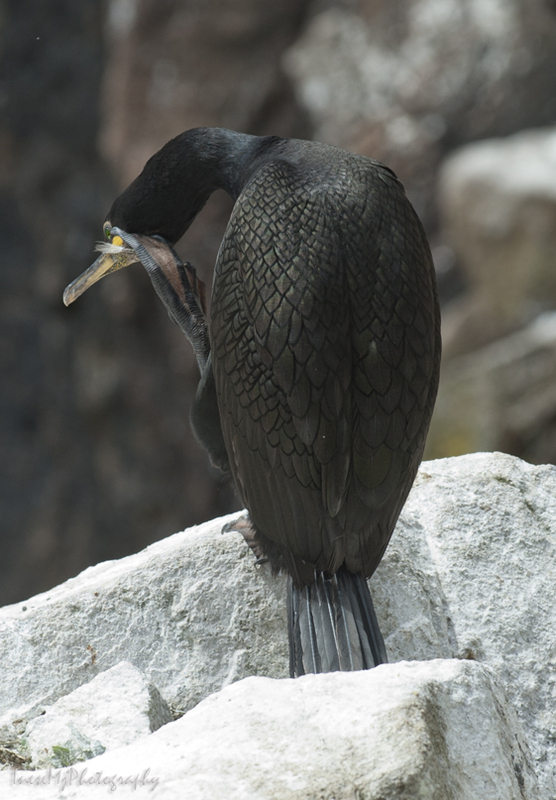 An adult bird is different, all shiny and beautiful. This is the place. 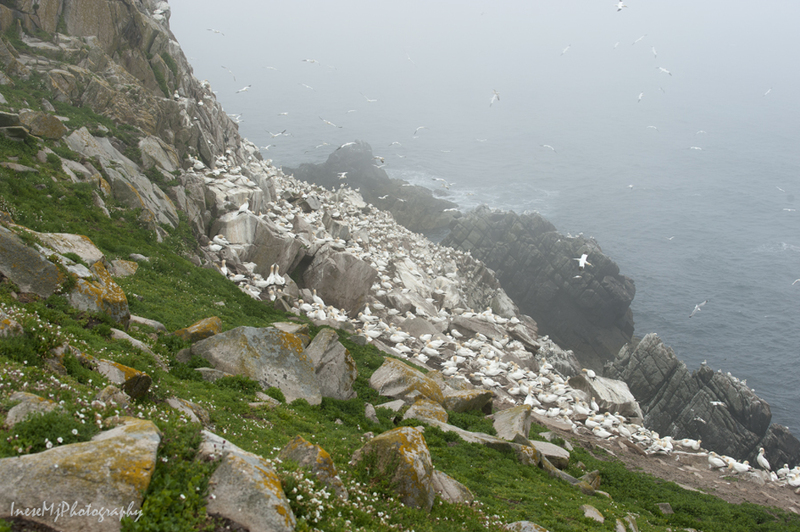 A small colony of Gannets are settled on the left from the Cat Cliff. 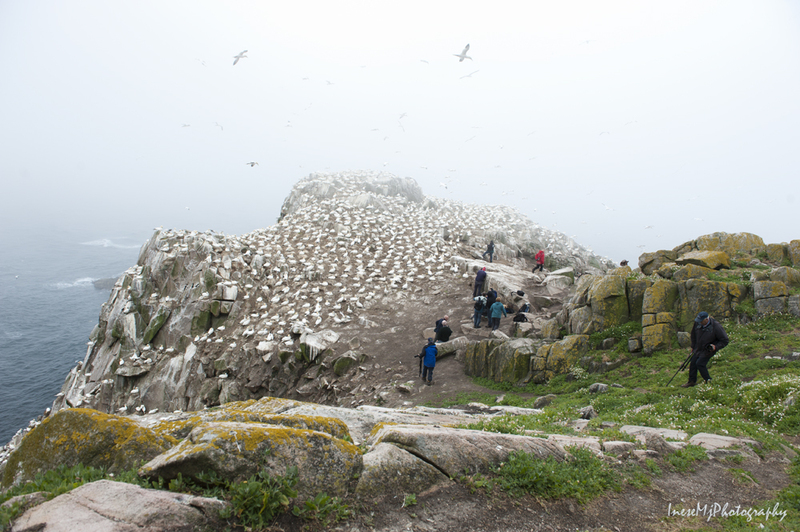 We don’t go there – it is a steep cliff and very little room for a tripod. This is the Cat Cliff itself. I sat there enjoying the sight, and took this panorama. Unfortunately there is no sky because of the thick fog. In my previous posts, there are more facts and more different photographs. If you are interested, you can go back and read these post – I have reblogged them. 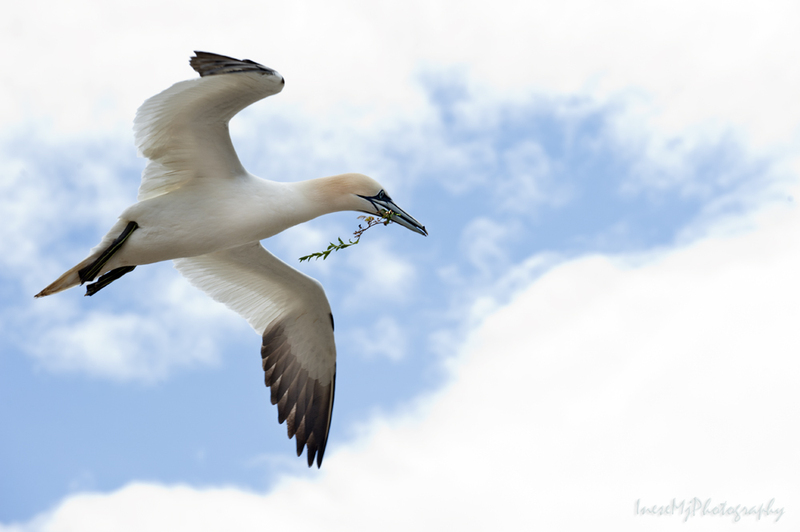 The sky is crawling with Gannets. 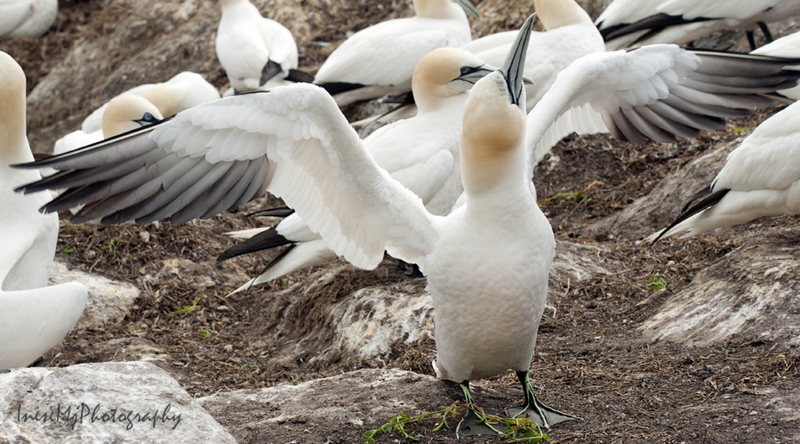 After landing the birds perform a “dance”. Sometimes they bring some weeds. 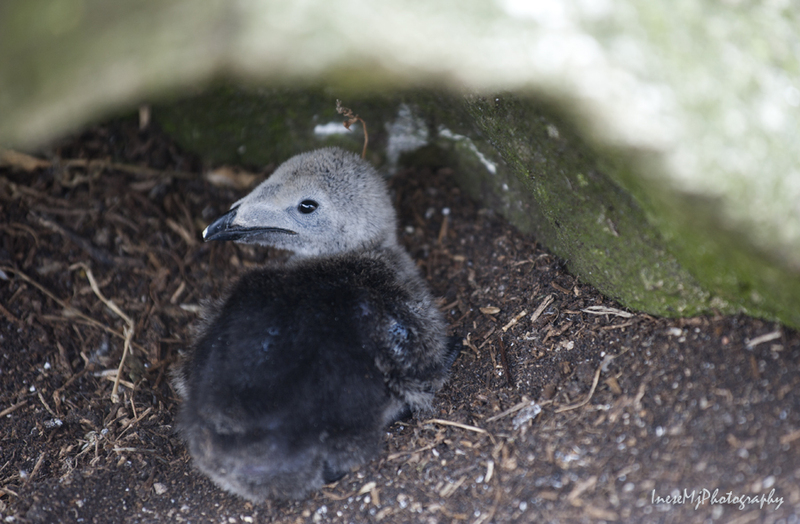 Under every rock there is a chick. I have no idea what bird they belong to. On the way back the sky cleared for a few minutes and I took another picture of the island. 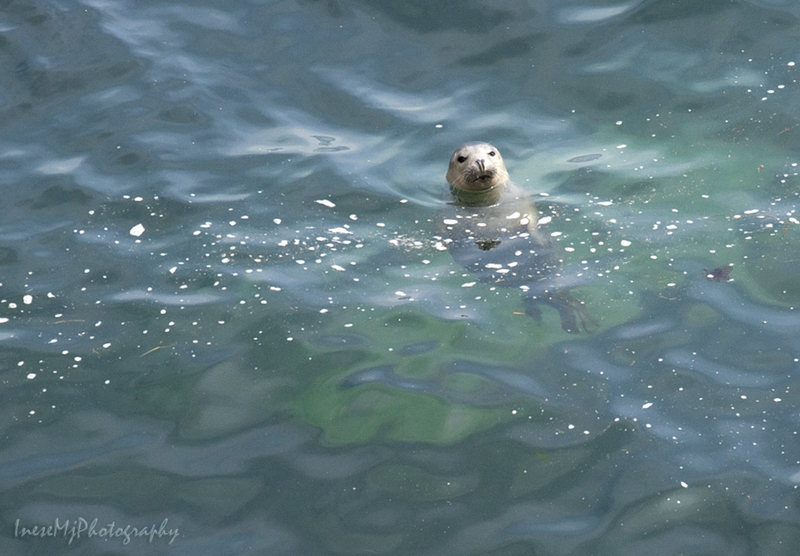 We also got to see the seals. The boat was coming in an hour. I started getting nervous. 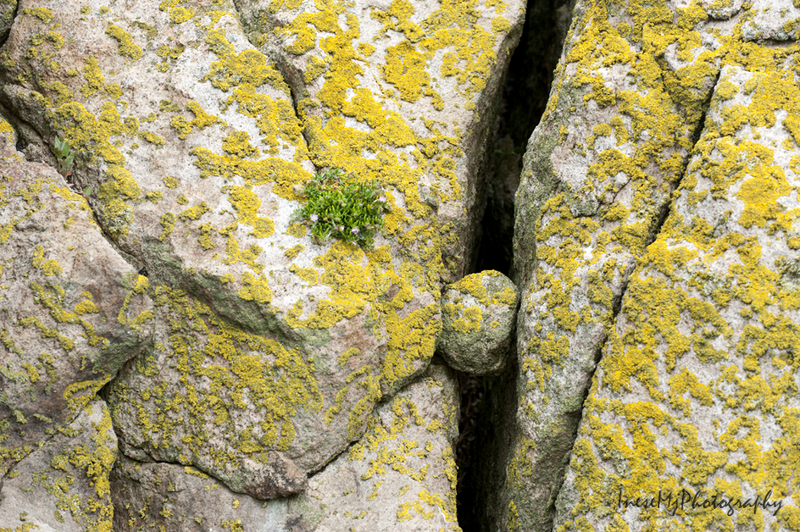 This photograph of a tiny rock that stuck between the big rocks forever shows exactly how I felt. 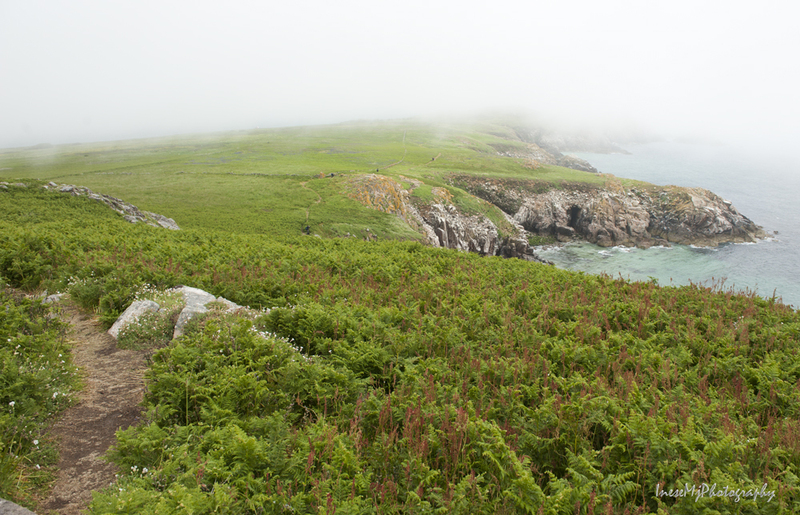 We went down to the Boulder Beach and sat there looking in the mist. Our motorboats finally came, the inflatable boats took us six at a time on board, and off we went again. Lucky me. The wind was not that strong, and I had never left the deck this time, all soaked in seawater but perfectly well and happy. Thank you for reading about my adventures! 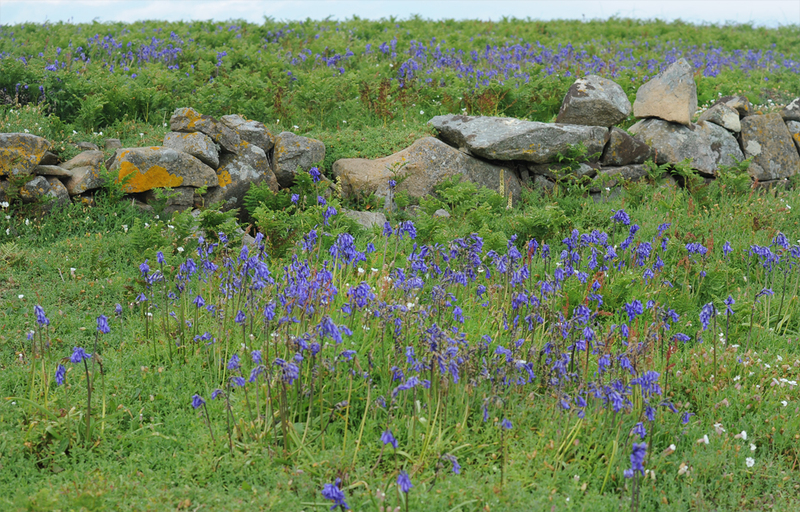 This looks like paradise for any wildlife enthusiast and photographer! 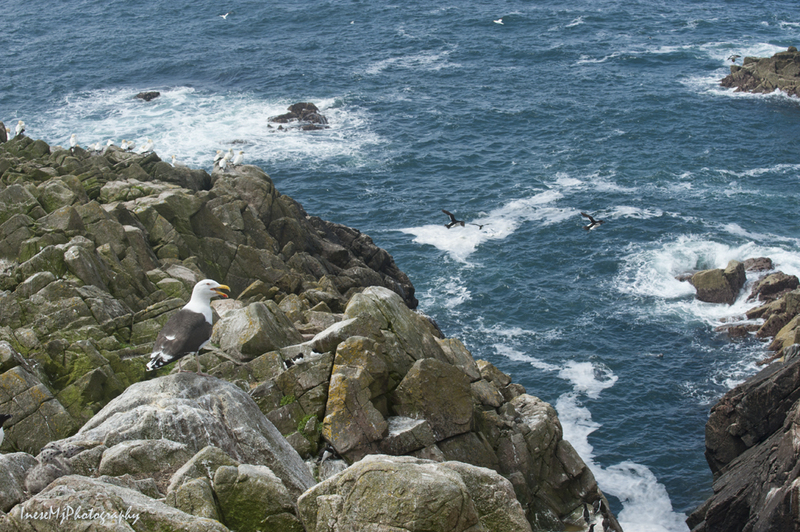 The cliff looks a bit challenging but what great shots you got. 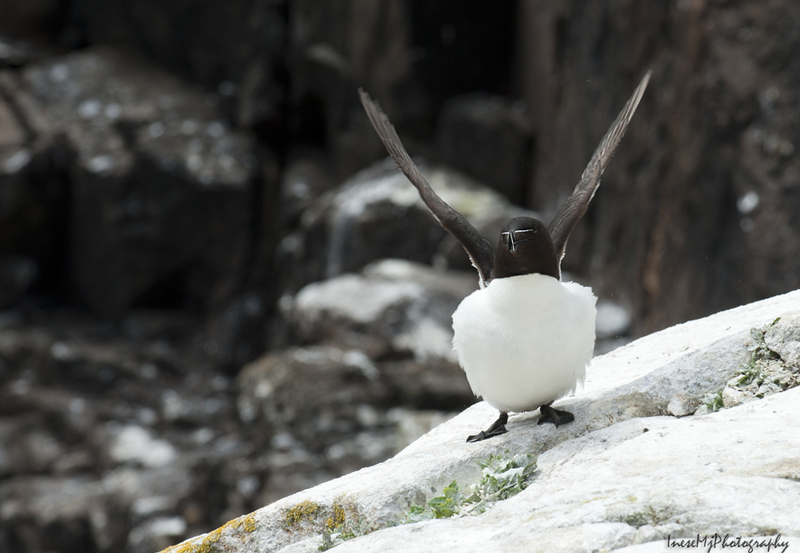 The Razorbills are so cute:) Lovely post! Absolutely stunning! That would be an artist’s paradise! Thank you for stopping by! The place is stunning indeed. More beautiful images Inese, this is a magical place. Thank you Andrea! I wish I could go there more often! Thank you Linda! 🙂 The island is a gem! Just some astonishing sights you show us. I have to comment on this you know me, that eagle? Well she or he does have great balance, just on the point of that rock looking down a cliff and she didn´t blink. They should put her on a circus….with me! Gorgeous but a scary experience too. It must be amazing to be there. Thanks for taking us on your trip! 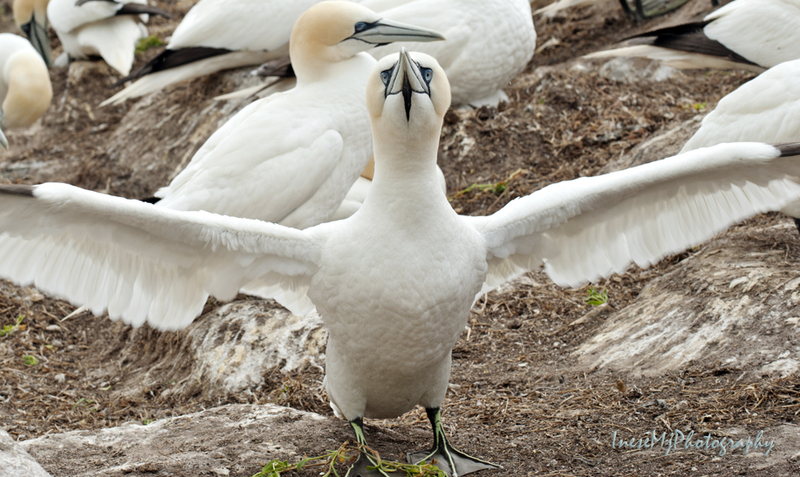 Inese – more great images and I love you take the time to learn about the birds and their nature. Their habitat is so different from my part of the world. Wonderful set of blogs! More wonderful pictures. 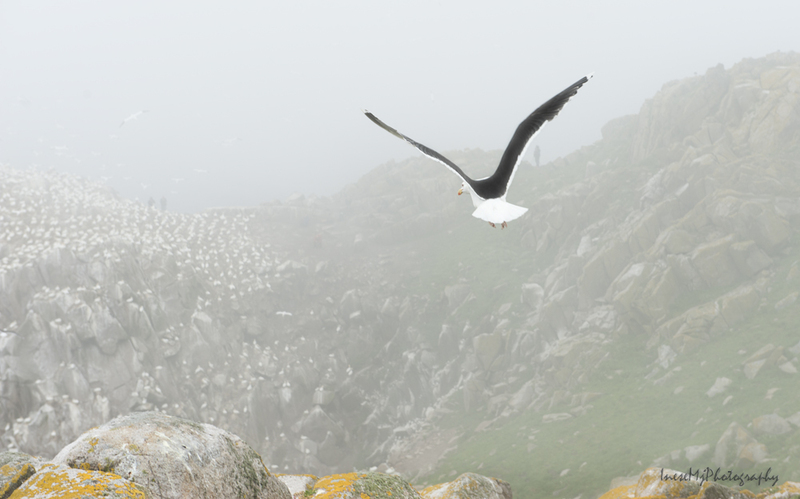 Scary gull incident; scary cliff. Another amazing follow on post!!!! Thank you for reading! It is the last post from my recent trip. Hopefully I will go to the Island again next year. Inese – You’ve outdone yourself this time around. The photos are stunning. You really do transport us to another time and place. Thank you. Thank you for your kind words, Sheri! Glad you loved the Island. Have a peaceful weekend! Thank you so much for your comment! 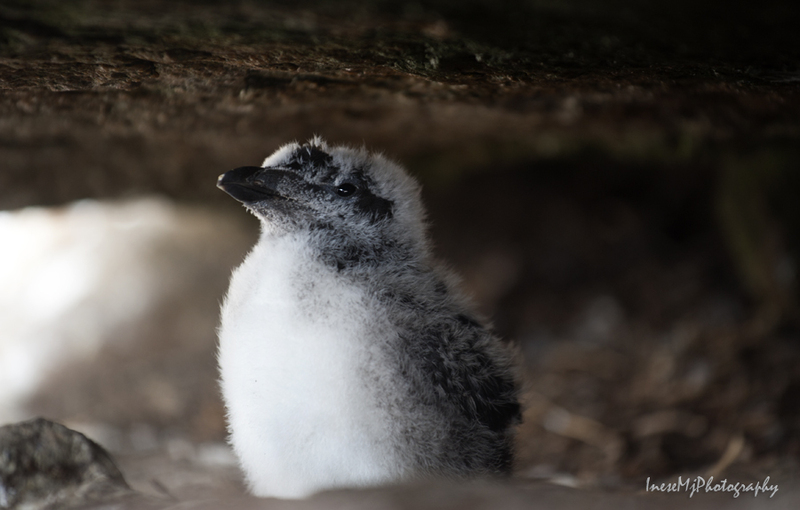 It is true that the sea birds prefer remote islands because of their nesting habits, and even there they stay only for a short period of time spending most of their life in the water. I am delighted to have the opportunity 🙂 Thank you again! 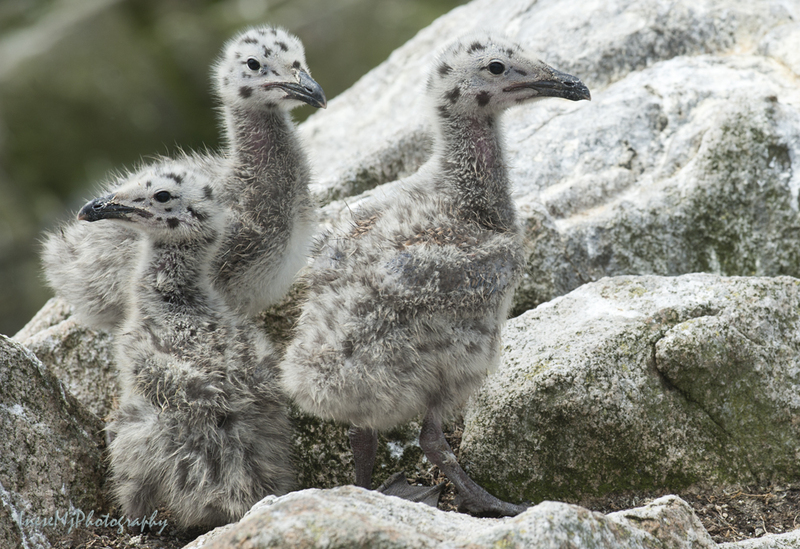 Lovely collection of photos…and the chicks and razorbills…indeed all the birds do look very cute. Nice one! And it was a marvelous adventure, indeed! Thank you so much for sharing it with us, Inese. 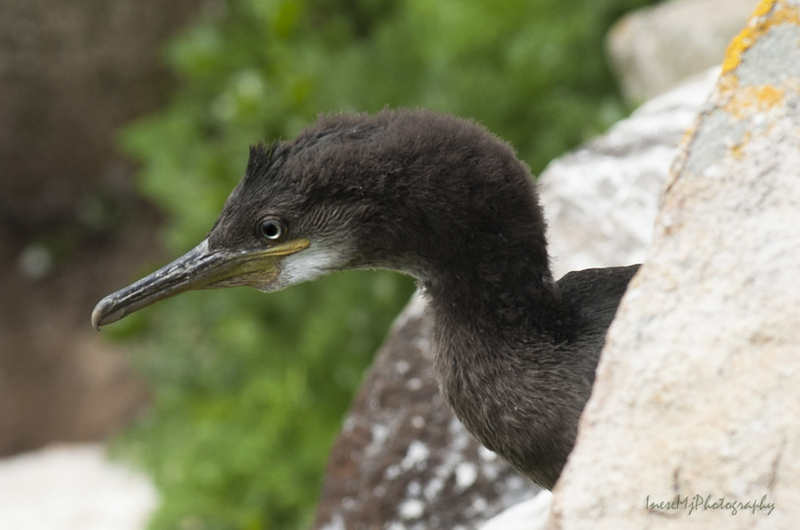 I was especially taken with the baby birds, but all the photos were fantastic. Huge hugs! Thank you! 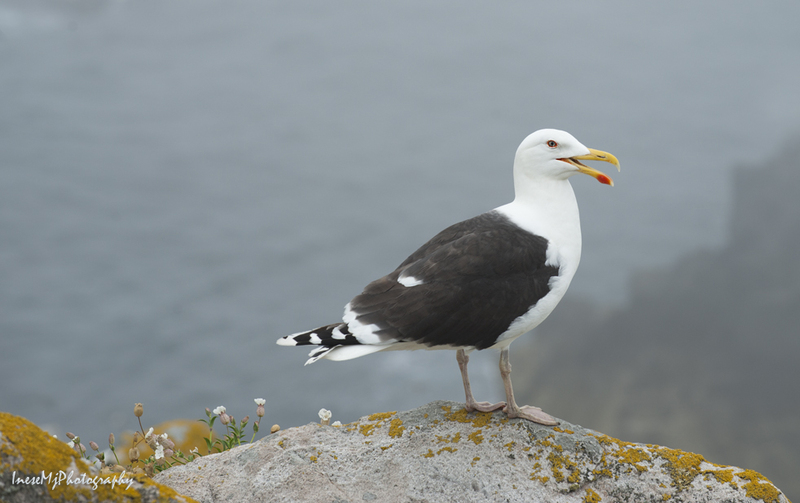 It could be worse 🙂 I have read that these gulls have killed at least two people in the UK. Sounds like a Hitchcock movie! Scary! I’d have been squealing like a little girl for sure!